Hello! 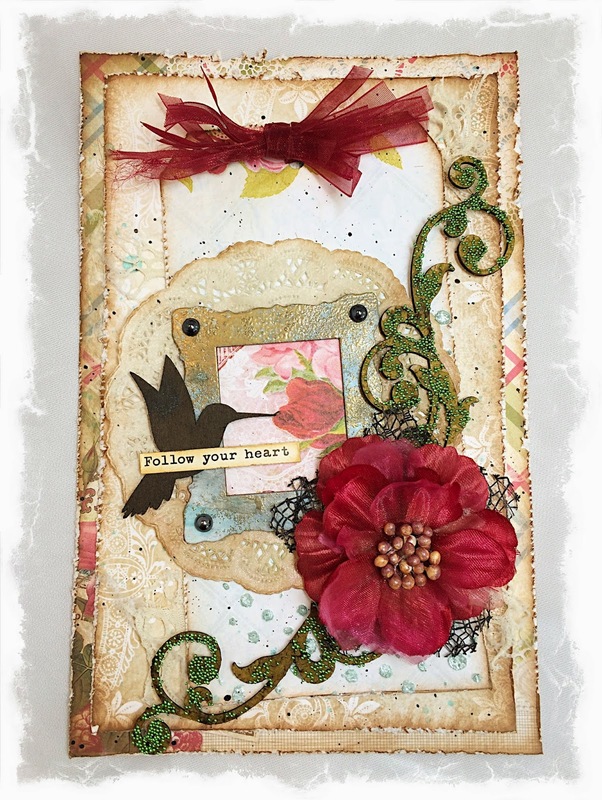 Today I want to with you to share some more projects I have made using more of the Blue Fern Garden papers. They are so beautiful and I am down to scraps now, but I have had such a fun time working with this beyond gorgeous collection! I'm trying to use up every part of each piece of paper, so I used this "Boudoir" piece that I cut an oval out of already for another layout, and went from there for this layout. The back has some green cardstock and the "Love Letters" paper that I fussy cut the lattice out of. 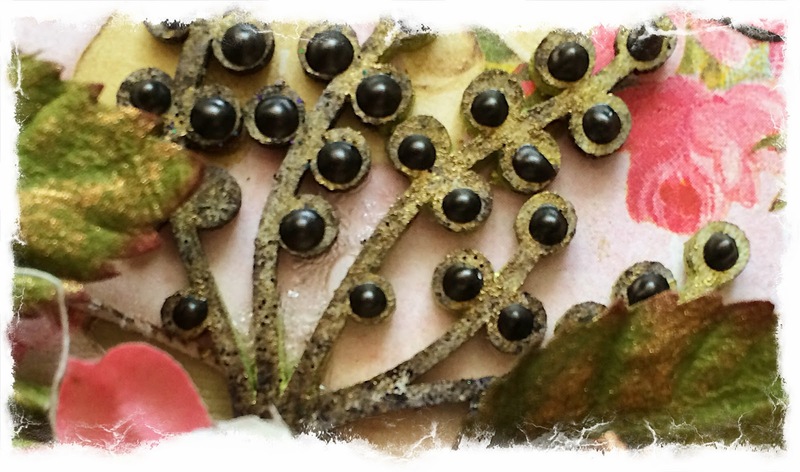 Primed with gesso, and then sprayed with some green gold mist, I then added some archival ink in black to these "berry stems", then added some Liquid Pearls in black for accents. 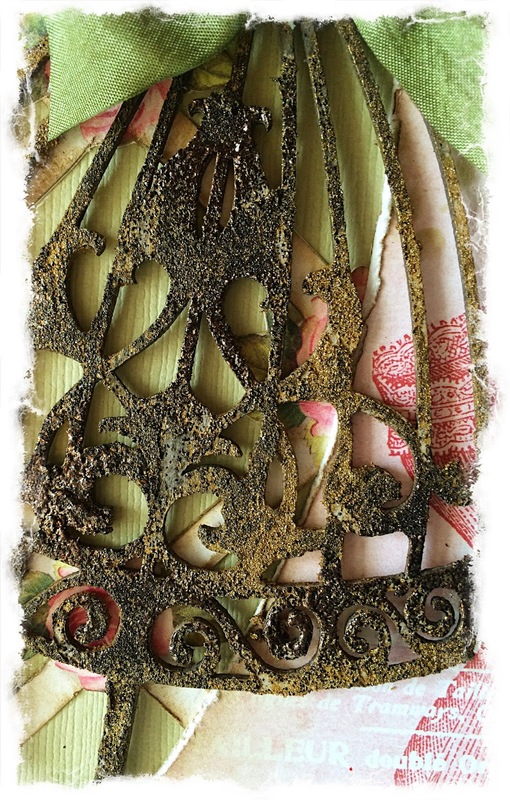 This is a close up of the "sweetheart dressform" that I treated with gold Ferro, then sprinkled black embossing powder over while still wet, and dried with a heat gun to get this distressed effect. Another project I made using the Blue Fern Garden scraps. 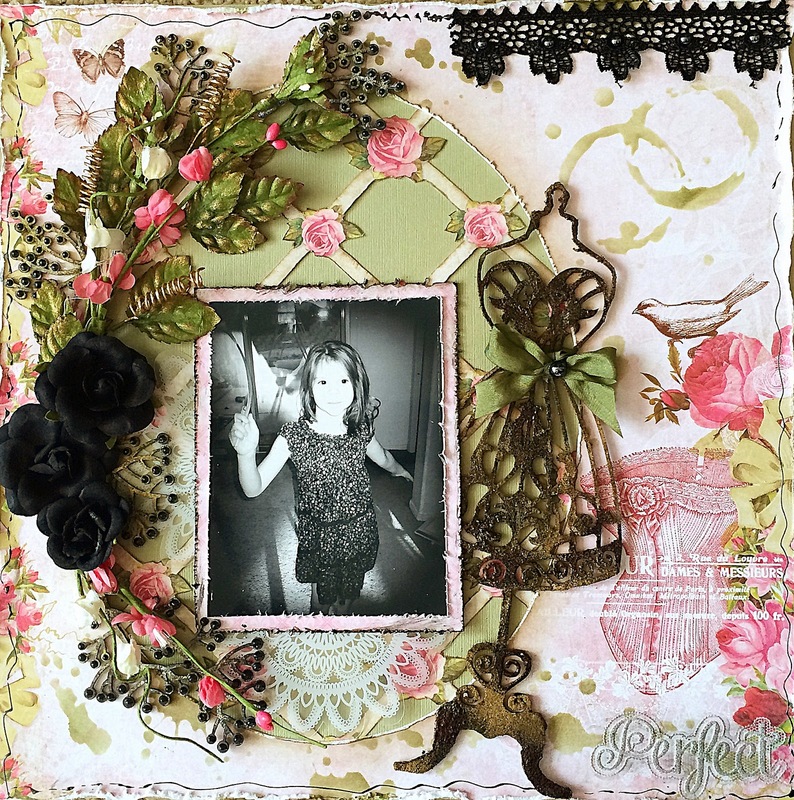 The frame is from the "petite boutique frames set" that I primed with gesso, sprayed with patina mist in random spots, then used some gold embossing powder. The scrolls under the flower are pieces I cut from the "large royal border." I painted it with dark olive paint, then added some bright green microbeads. And, lastly, here is an altered project I made using a mason jar. I've made a few of these, and I give them to friends as gifts. I saw this idea on Pinterest: keep a mason jar handy and when something good happens, write it down on a piece of paper, fold it up, and throw it in the jar. At the end of the year, take all of the pieces out and read all of the good things that have happened for that year. In the pin, the mason jar is plain, but it's much better to have an altered jar on the counter! 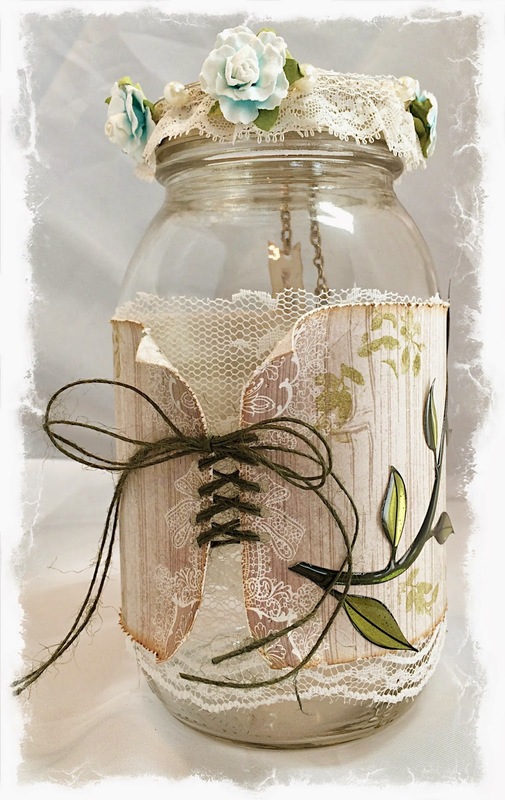 The jar is covered with a piece of "In Bloom" paper that I stamped and distressed. The little flag is from the bottom strip of one of the papers. The bird cage is from the "grande cages set." I covered it with Perfect Pearls in heirloom gold, which gives it a perfect finish- not to shiny! I added pearl strips and accented the butterfly with Smooch inks. Thanks for taking the time to look at my projects today! you do beautiful work. Where did that dress form come from? Beautiful work!! 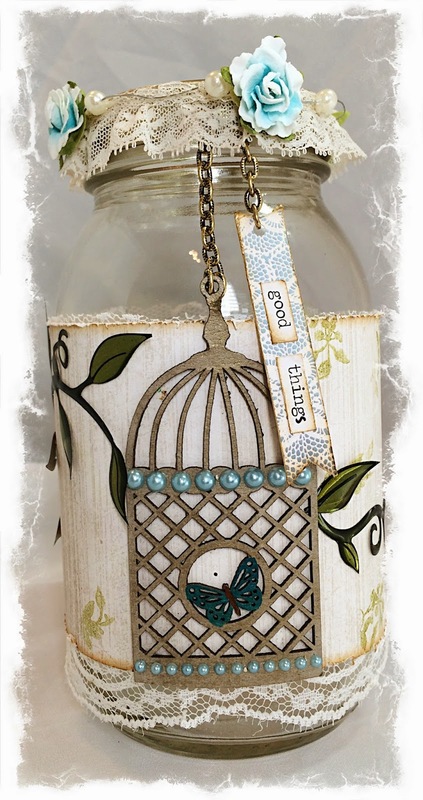 I really love the layout and the altered jar!